LOVE the cover of this book. I'm sure I'll like what's inside too. Don't you just love getting things in the mail? And I don't mean the bills, I mean the fun stuff like magazines, books, clothes, or decor items. That's what I get excited about. Somehow this week, I've gotten really lucky. Yesterday was a package from J.Crew and today will be books that I've been dying to get my hands on. One of the books just came out today, and I had to have it ASAP, so I preordered it like a good patron. 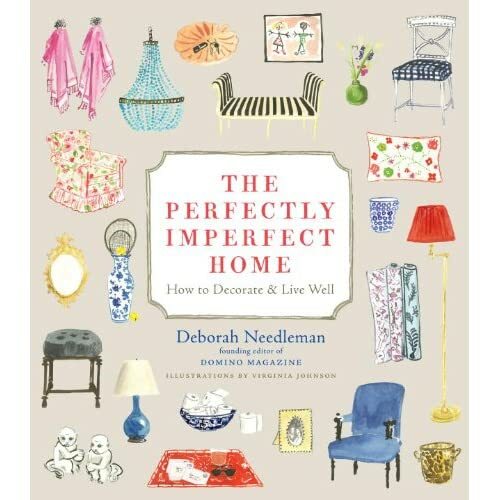 It's none other than Deborah Needleman's highly anticipated book, The Perfectly Imperfect Home. If you didn't know, Deborah was the Editor-in-Chief of the beloved home magazine, Domino. I know if there is anyone who should write a book about the home, it should be her. The other is Design Sponge at Home by a home design blogger who knows her stuff, Grace Bonney, the creator of the ever-popular blog Design Sponge. I'll be UPS tracking these books like a hawk, and the minute I get my hands on them, I will be poring over them on my couch with a cup of tea. And if I'm really lucky today, maybe Emma will join me on the couch? Design Sponge is so beautiful. I haven't even opened it yet. Just keep staring at the cover :) Enjoy!